The better an author knows his or her own social media followers, the easier it will be to connect with them on a deeper level. 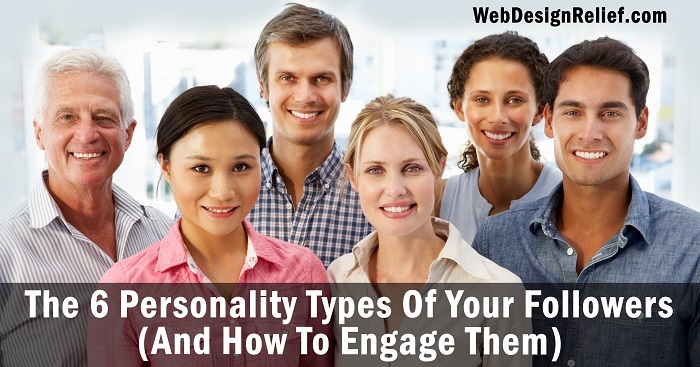 However, no matter how organically you’ve grown your social media following, your audience will be made up of many different personality types. At Web Design Relief, we know that effectively engaging the different personalities of your followers can result in stronger bonds and more successful author marketing and promotion efforts. Though the word “lurker” has a sinister undertone, most social media lurkers are simply shy, introverted, or just reluctant to share the details of their daily life with the online world. They tend to follow or friend only those people they know well, or writers whose interests align strongly with their own. How to connect: Social media teems with silent observers. They read lots of posts but rarely post themselves. Intrigue these quiet listeners by sharing high-quality content that provides generous takeaway benefits. Passionate about a cause (or several), the activist strives to harness the power of social media to inspire others to take up the flag. You’ve watched them run marathons, share news articles, and encourage those who share their sensibilities. How to connect: Engage activists by acknowledging their passion and inspiration. And if you happen to support the same causes, don’t be shy about cheering them on. Nurturing, warm, and conscientious, the earth mother (or father) always chooses a Facebook “heart” over a “thumbs-up” icon. These followers love to post inspirational quotations, pictures of pets, and videos of gamboling lambs. And they’re also the first to connect with someone in need and commiserate with people who are facing challenges. How to connect: Attract the attention of this audience by responding in kind: Be generous with hearts, winks, and smiley-face emoticons, and share your own inspiring images. Posting an occasional meal, selfie, or video of a child’s trumpet performance is a perfectly acceptable use of social media. But when you can fill out a follower’s weekly food diary, recognize every outfit, and remember the date of his or her son’s next recital—you’ve definitely stumbled upon an oversharer. How to connect: Oversharers adore being part of a larger community. As long as they don’t dominate your news feed, charm these followers by being generous with likes, positive comments, and judicious shares. Everyone loves to laugh, and the social media comic knows it. This fan is the one who always has the wittiest comeback, usually attached to a hilarious meme or the perfect gif. As the life of the social media party, he or she often has a large and organically grown social media following. How to connect: Engage your funny followers by being an active member of their fan clubs: Join the laughter, share your own memes, and comment freely on posts to interact with their followers—who definitely share your sense of humor and possibly your admiration for authors and books. Some social media followers have their own interests in mind. They post nothing but promotional content, spam you with private messages, and constantly work the hard sell. Don’t connect! These are not the kind of followers any author wants to interact with. If they become too persistent, consider blocking or unfollowing them. Unfortunately, not all of your social media followers are going to be good-hearted and kind. Combative, mean-spirited, and verbally abusive followers (AKA trolls) are all too common. If you find yourself under attack, don’t feed the trolls by gifting them with the attention they crave. A level head is the best way to combat negativity so you can go back to enjoying your social media experience. Question: How would you define your own personal social media personality type?